In a previous column, I talked about ways to place and size pattern repeats for small projects like mittens. But of course, pattern stitches are often used in garments too. There are three key differences when designing garments: you’ve got more stitches and therefore a larger canvas, different parts of the garment are more (or less) visible, and you’ve got to consider shaping – armhole/raglan shaping, most often. There are two types of patterning to consider: a larger motif – which may be composed of several smaller elements – or a single smaller pattern, repeated all over. A classic “Aran” sweater is a nice example of the first type, and that’s what I’m going to cover in this column. I’ll talk about the second type in the next column. 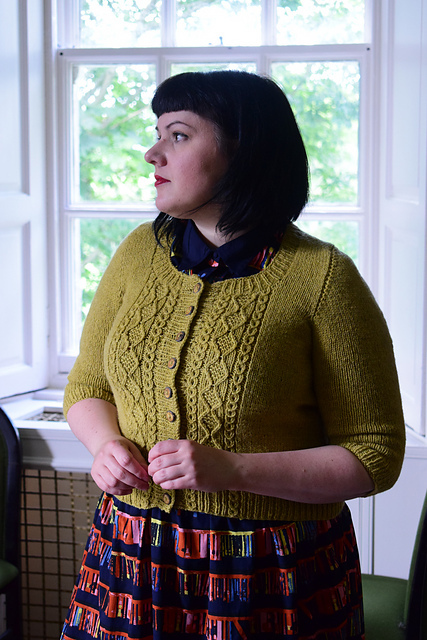 In a classic Aran sweater, the motif is composed of one or more cable patterns, arranged so that they are centered on the garment pieces – back, front (or both fronts if it’s a cardigan), and even on the sleeves. The motif may fill a small portion of the garment, or most of it. The edges of the garment, those stitches outside the motif, are worked in some sort of ‘background pattern’ – stocking stitch, reverse stocking stitch, or a moss or seed stitch pattern. Grading these patterns is fantastically easy, aided by those background patterns. The absolute simplest path to grading a pattern for a garment is to choose a pattern that fits into the smallest size, and then creating the larger sizes by adding more background stitches. Norah Gaughan’s Beatnik works like this. Although the cable motif is wide, there are ‘plain’ stitches worked either side, which easily allow for making the garment larger. Designer – Norah Gaughan. Photographer – Chris Vaccaro. Used with permission. This works very well if there isn’t *that* much difference in size across the range you’re grading – for example, a garment in baby and toddler sizes, a range of sizes for school-age children to pre-teens, or for women. In this situation, you can make it much easier on yourself and your knitters if you make sure that the central motif fits not only inside the smallest size, but specifically inside the upper body of the smallest size. That is, if there is any shaping to be done for the armholes, that the motif fits inside the body above the armholes – after the shaping if you’re working bottom-up, or before the shaping if you’re working top-down. Any shaping is worked in the background pattern, making it simpler for the knitter to work, and also for you to write up! It avoids the challenge of shaping in pattern, it avoids any confusion about how to handle partial motifs, and leaves you with a plain edge for picking up stitches or seaming. Karie Westermann’s Incunabula is an excellent example of this sort of design. Designer – Karie Westermann. Photographer – David Fraser. Used with permission. If you’re creating a garment pattern for a wide range of sizes – babies to teens, or petite women to larger men – you’re going to end up with a scaling issue. That is, a cable that takes up most of the front of a baby sweater is going to be pretty tiny on a large adult sweater, and the garments will look quite different. Adding multiple repeats is as it sounds. I particularly like patterns that have smaller repeats embedded within them, like these interlaced cables. They scale easily, but look the same across a wide range of sizes. And you can use smaller elements to expand the motif, too, and grade those. This provides a bit more flexibility with the grading. After all, even in a range of sizes for women, there can be a fair bit of difference between the smallest and largest sizes – you can end up with pretty large swathes of “background”. Fill some of that background with smaller motifs alongside the main one: a simple rope cable, for example. And you can even scale those motifs; use a 4-stitch twist for the smaller sizes or heavier gauges, a 6-stitch twist for middle sizes, an 8-stitch twist for larger sizes or yarns of a finer gauge. Using smaller elements like this allow you to fill more of the garment with the lovely pattern, too – so you’ve got less of the ‘boring’ background and more of the good stuff! Amy Herzog’s Alta uses this strategy nicely. Designer – Amy Herzog. Photographer – Jonathan Herzog. Used with permission. These smaller elements can also be used to fill the section of the body that’s under the arms, the section that is decreased away in a bottom-up garment, or increased as you work a top-down garment. You can reduce the amount of “boring background” even more. 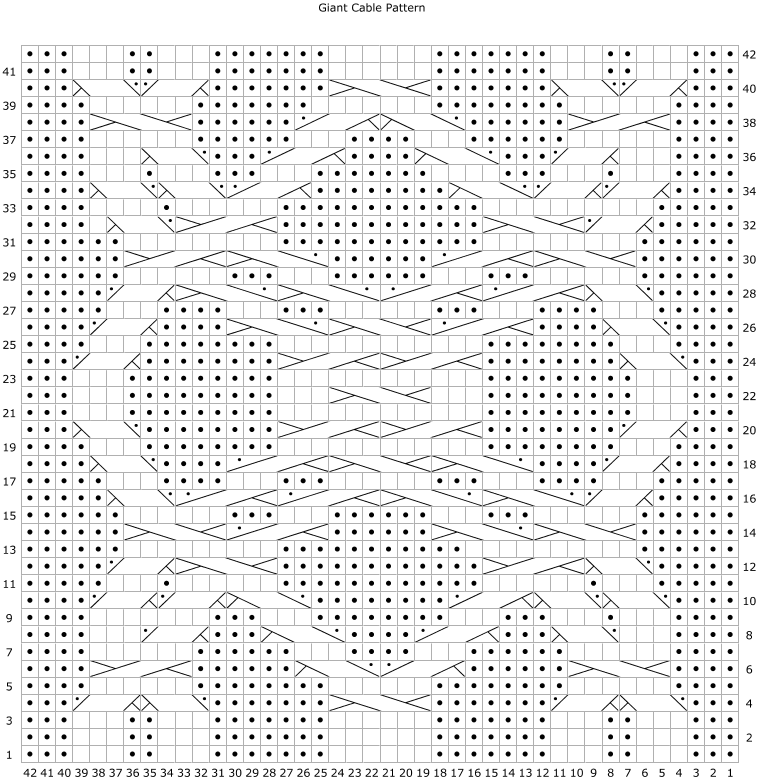 That way, although you’re shaping within a pattern, you’re shaping in smaller motifs. 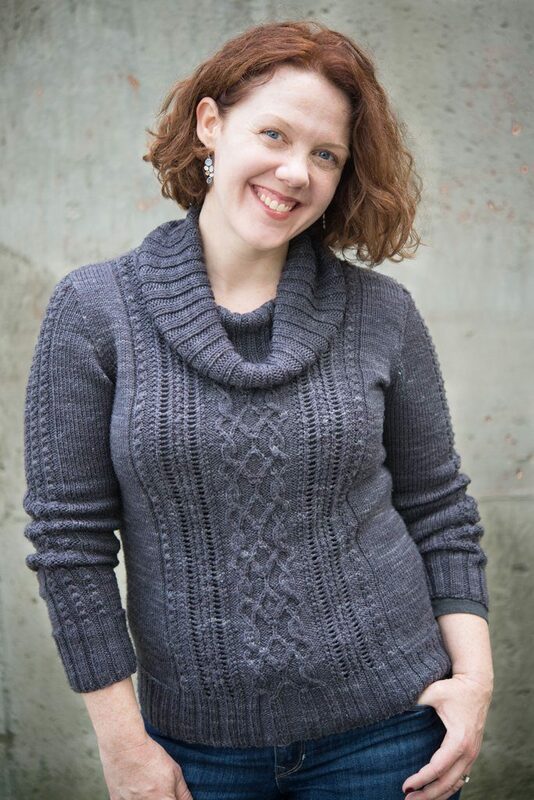 For example, if you’re working a top down sweater with raglan increases with four-stitch cable elements, start the side motifs as soon as you have four stitches increased. This allows you add patterning early, as opposed to having to wait until you’ve increased enough stitches for a larger pattern motif. And if you’re working bottom up, of course, keep working the motifs as long as you have enough stitches. If you’ve got a lot of smaller individual motifs, you can keep them going longer and/or start them sooner. 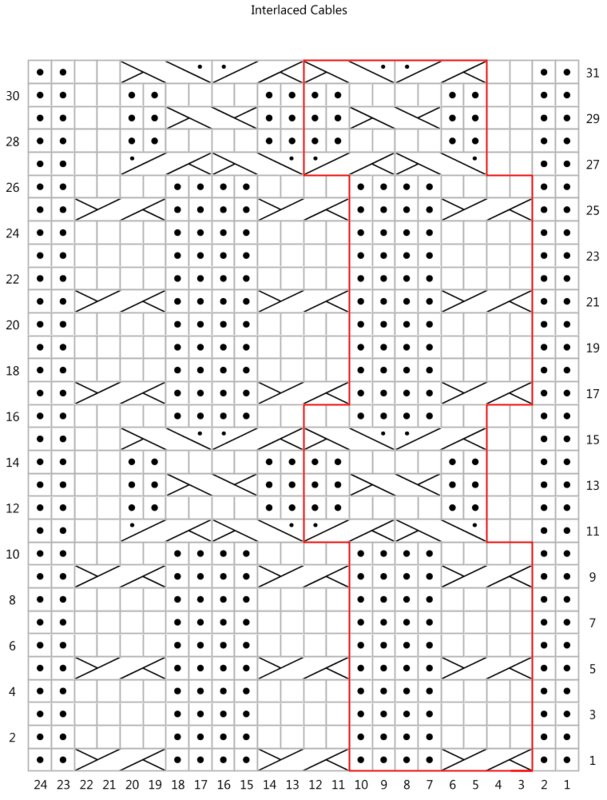 But if you’re using larger patterns – this 36-stitch motif, for example – shaping quickly becomes very complicated. If you had to work decreases into this pattern, you have a tricky decision to make. Once you’ve decreased even two or three stitches, you don’t have enough to work the full cable pattern. Do you attempt to keep a partial pattern going, working only the central part of it, or do you just discontinue the motif entirely? If you opt for the first, it could look untidy, and if you opt for the second, you’ll suddenly have a large plain section where there was previously a pattern. And not only does that change the look of things fairly significantly, but it could also change the size of the piece you’re working: after all, cable fabrics are tighter than non-cable fabrics. And either way, this adds complexity to the knitting, and the instructions themselves. 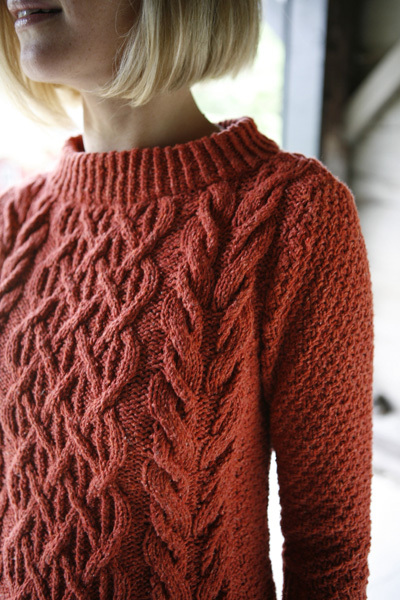 Next time you’re looking at a cabled sweater, examine how and where the patterns are placed. There’s logic in the blank spaces and pattern fillers, and those little decorative side elements aren’t just there for beauty.